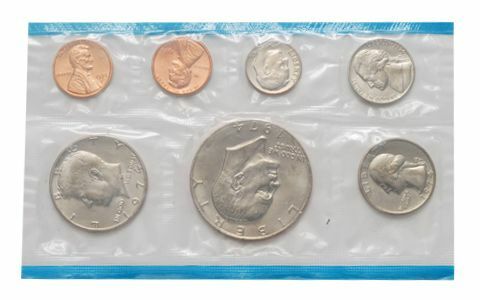 In 1974, collectors were treated once again to Mint Sets with two Eisenhower Dollars. Sales remained high, falling just shy of the 2 million mark. 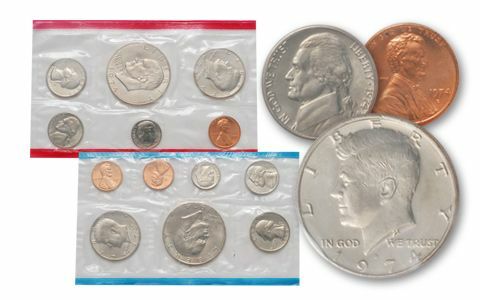 About the sets: The coins in the 1974-PDS Mint Sets were Uncirculated pieces pulled from regular production runs, thus the quality of the individual coins varies widely from set to set, and even within a set. A small number of 1974-D Eisenhower Dollar have been found struck on 40% Silver Clad planchets. Although most (if not all) of these were discovered outside of U.S. Mint Sets, some Mint Sets might contain them! Some sets may also contain a rare and popular 1974-D Doubled Die Obverse Half Dollar that shows strong doubling on IN GOD WE TRUST and the date. 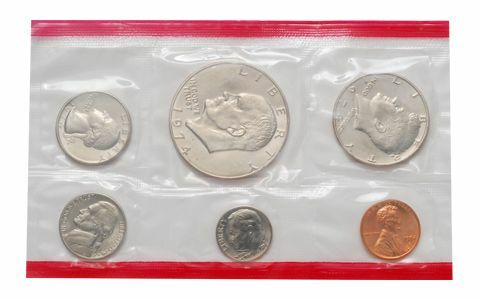 Original packaging: The coins in the 1974-PDS Mint Set were sealed in two pliofilm flat packs: the D-Mint coins were placed together in one of the packs, and the P- and S-Mint coins were placed together in another. The pack containing the D-Mint coins was edged in red; the pack containing the P- and S-Mint coins was edged in blue. The two pliofilm packs and two pieces of thin cardboard (for protection) were sealed in an officially inscribed, white mailing envelope. President Nixon resigned in disgrace. In one of his first acts of office, new President Gerald Ford pardoned Richard Nixon. The Symbionese Liberation Army kidnapped newspaper heiress Patty Hearst. A huge "army" of nearly 8,000 terra-cotta soldiers was discovered in Shaanxi Province, Central China. The world population reached four billion people.